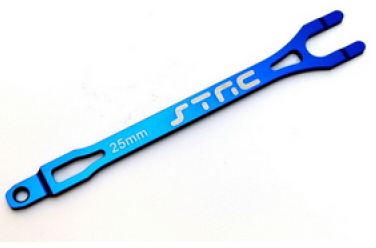 Aluminum CNC Machined Pro Racing Battery Strap for Traxxas Slash (Blue) Discounts Apply ! SPTST3727B - Aluminum CNC Machined Pro Racing Battery Strap for Traxxas Slash (Blue). Add more strength and battery position adjustability to your Traxxas Slash with our Pro Racing CNC Machined aluminum battery strap. Those that runs Lipo batteries (especially Team Orion/Kokam batteries) have a difficulty moving the battery forward and putting the foam spacer behind due to the design of the stock plastic battery strap blocking the battery plug. For better weight distribution while running lipo packs and for more handling tuning, moving the battery forward while running a lipo pack can help with better steering and overall weight balance on the Traxxas Slash. Our battery strap also allows for better access for lipo batteries that have plugs that comes out from the side of the pack (SMC, Robitronics, Reedy...etc.) Our battery strap also help in providing more clearance for owners that runs side by side NiMH batteries that use battery bars as terminals, ST3727B.